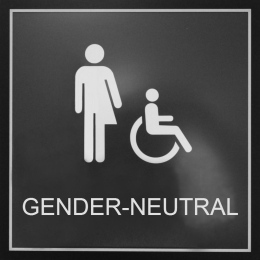 A sign for gender-neutral bathrooms has been made, and it’s awesome. Because it’s no longer considered couth to bash trans people as disgusting and disordered—unless you write for the National Review—transphobic commentators have started channeling their animus into concrete complaints about the trans movement. Usually, these center around trans people’s desire to use public restrooms with dignity and comfort by lobbying for gender-neutral bathrooms. This campaign flummoxes the likes of Fox News, which frequently puts forth a well-worn talking point: Are gender-neutral bathroom signs just too confusing to ever be used in practice? Now, the marvelous Sam Killermann has a solution to Fox et al.’s problem: A whole new sign that jettisons the traditional male/female pictogram for—wait for it—a drawing of a toilet, free of any gendered baggage. The design caught the eye of a sign company that was eager to ditch its perplexing, cross-dress-ish gender-neutral sign. Killermann agreed to let them produce it, on the condition that the company make a donation to the Transgender Law Center. Now the signs are being manufactured and donated to colleges; you can also buy one for your own office. I’m not entirely convinced that gender-neutral bathroom signage was ever as huge a problem as some conservatives made it out to be. But thanks to Killermann’s signs, they no longer have an excuse to carp. 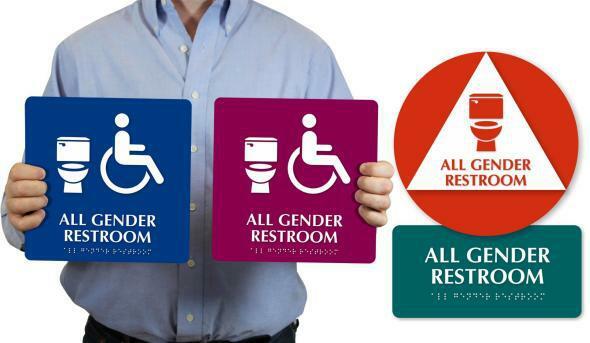 Creating an easily understood bathroom sign, of course, won’t alleviate trans people’s struggles on its own. But it might encourage more companies, colleges, and municipalities to build gender-neutral bathrooms, or perhaps turn existing bathrooms into gender-neutral ones. And that will surely help ameliorate the near-constant distress many trans people feel when they’re far from home with no safe space in which to attend to their most basic needs.